This month’s Project Quilting Focus Through the Prism challenge theme was the 9-patch block. 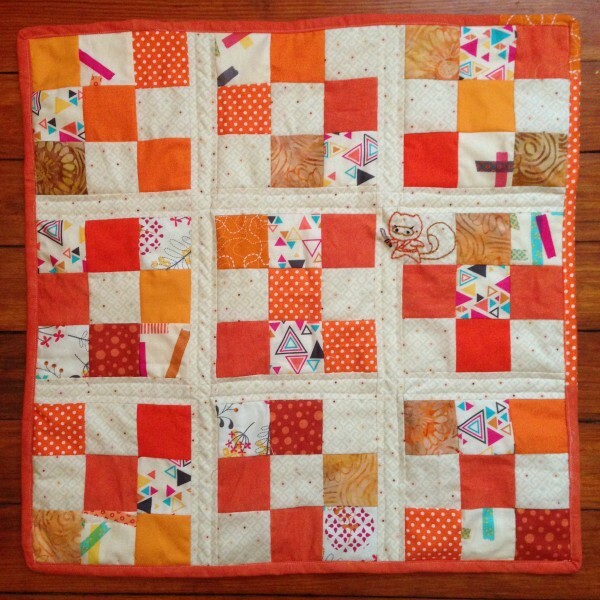 For my version of the challenge, I created a simple 9-patch design using orange fabrics. I decided to add a fun ninja squirrel for my embroidery design – this is not an actual requirement for the challenge quilts, but it’s a fun little challenge I’ve given myself to add some hand embroidery to each of my Focus Through the Prism mini quilts. 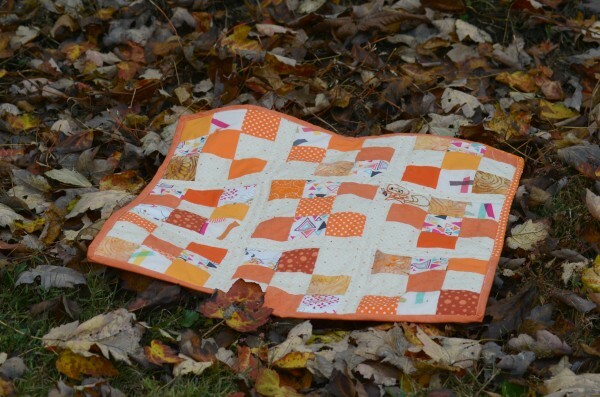 Have you been participating in the Focus Through the Prism Challenges over at Project Quilting? What is your favorite so far? What are you hoping the last challenge will be? Squirrels are my spirit animal. Love this and always enjoy seeing what you are going to post each month, because of the embroidery! Thanks so much Kimberly! I’m not really good at embroidery, so I made that extra bit of a challenge for myself to improve my skills – ok, mostly my patience – with hand work. And I’m really starting to enjoy the process. Love it! Your orange and white really pops- and I can see it as a hanging or sweet candle/table mat with a nice harvest candle (being attacked by the ninja squirrel). Haven’t gotten mine done yet this month, but love seeing what everyone posts. I’ve also been attracted to embroidery lately- I picked up one of Rebecca Ringquist’s sampler books- so fun! Thanks Merrilee! 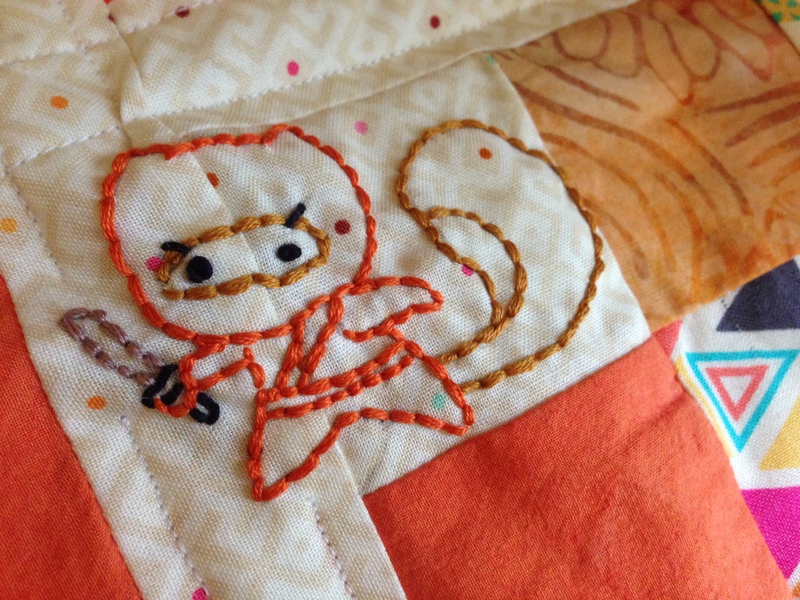 When I decided to work with the orange in October, I wanted to do my best to make the quilt less Halloween, which is how it ended up with a ninja squirrel on it. That squirrel is so freakin’ cute! And generally I’m not a fan of squirrels – traumatic childhood incident! 🙂 And a fun little mini quilt. I’ve not heard of Focus through the Prism, but I’ll be checking it out. Thanks Jenn! Next month is the last Focus Through the Prism Challenge, but they have been part of the off-season monthly challenges from Project Quilting. You should definitely check it out. I think you would have a lot of fun doing them. Thank you Jen! I had a lot of fun doing it. Lol, this is a great quilt anyway, but the squirrel puts it over the top! Thanks so much Kat! The squirrel was a lot of fun to embroider. Haha!! 😀 That squirrel is awesome. Love it. Thanks so much Lynette! I had a lot of fun with this mini quilt. Love this! The little creatures you’re adding are just perfect! Thanks so much Kim! It’s been a lot of fun picking out embroidery patterns to go on each of my designs.